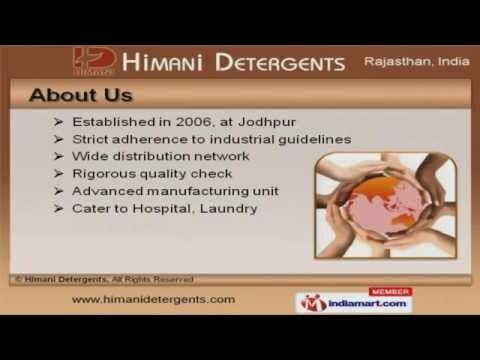 Welcome to Himani Detergents, Manufacturer and Supplier of Detergent Products. The company was established in 2006 at Jodhpur. Advanced manufacturing unit and Wide distribution network help us to Cater Hospital, Laundry and other areas. Ethical business practices, Skin friendly products and International quality standards help us to achieve an unrivalled position in the industry. Our product list covers Washing Detergent Powders, Acid Slurry and Textile Chemicals. Detergent Cakes and Dishwash Bars offered by us are best in the industry amongst others. Detergent Powders and Master Detergent Cakes are widely acclaimed in the market. We have gained tremendous expertise in providing Washing Detergent Powders and Cakes. Our organization is highly involved in providing an impeccable range of Acid Slurry and Textile Chemicals that are a class apart. The customer can place his own preference in terms of Linear Alkyl Benzene Sulphonic Acids.